Saving utilities time, resources + money. TOP UTILITIES ARE IMPROVING CALL OUT AND RESOURCE MANAGEMENT FOR EMERGENCY EVENTS AND DAILY OPERATIONS. ARCOS software solutions have been designed specifically to meet the needs of utilities during an emergency, restoration and all hazard events. We continuously partner with the VPs, supervisors and managers of top utilities across the nation to understand their operational challenges and meet their needs. Thanks to these strong relationships with our customers, our resource management software continues to help top U.S. utilities pre-plan, respond, restore, and report in real-time during all service restoration events like regional power outages, gas leaks and more. Electric utilities, gas utilities and power generation plants are reducing their risk as well as saving time and money by automating their emergency response and crew management processes with ARCOS. 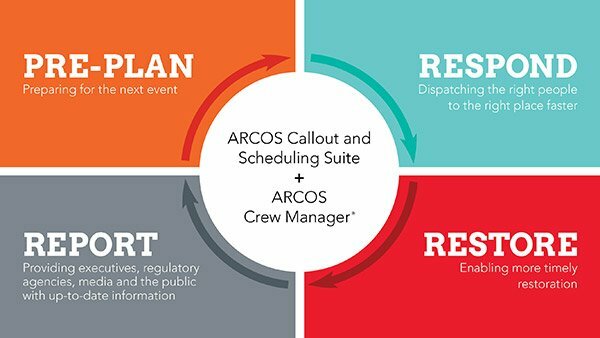 ARCOS Callout Suite helps to reduce the time required to assemble and track repair utility crews from hours to just minutes by automating the calling process and complex scheduling, union and business rules. It also provides improved situational awareness into operations and reporting during events. ARCOS Damage Assessment for utilities helps shorten the assessment process after a storm or hazardous event from days to just hours. Using the utility’s GIS system and device location services on any mobile device, assessors can rapidly report and transmit damage, which is immediately available to emergency personnel to help estimate time of restoration (ETR). ARCOS Mobile Inspection saves time on routine field inspections by providing a guided assessment and real-time communications on equipment needed for repairs. With an automated inspection process, utilities are able to transition from a reactive maintenance to a predictive maintenance approach. ARCOS sMART helps to expedite restoration with mobile crew location and logistics for external crews. This application enables utilities to more easily manage contractors and mutual assist responders via a visual location map. Responders simply download the sMART application to their own mobile device and receive directions to staging areas and information on lodging, meals and re-fueling. ARCOS Crew Manager is a resource management system that centralizes information on utility crews, resources and supporting logistics in one easily accessible application. Thus, it provides utility supervisors and managers with a real-time visual window into crew and resource location, crew availability and how much money is being spent. 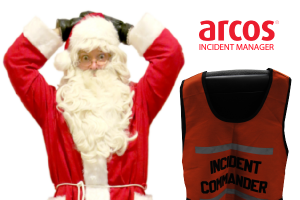 Crew Manager is used for day-to-day operations and emergency planning.